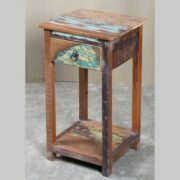 This is a distressed bedside with coloured glass panels. 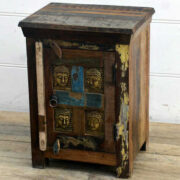 It has a drawer and a door, from India. 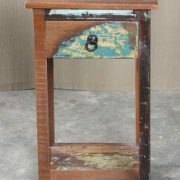 Fabulous and chunky distressed bedside unit painted in pastel creams, pinks, reds and blues. 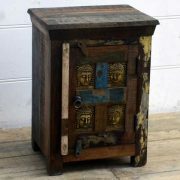 The cupboard door has four small dark green patterned glass inserts in the door that catch the light on a sunny day, making it a special and unique piece. There’s one drawer and one shelf in the cupboard. They’re practical and gorgeous. We love these.